Senior Sidney Luna-Long stiff arms a defender, while trying to turn the corner. South Pas football was triumphant once again, routing the Alhambra Moors 27-0 on Friday, September 22. On the brisk fall night, the Tigers were able to take care of the Moors with ease, extending their preseason record to 4-1. Senior Gavin Chi clings to the ball while being swarmed by defenders. After the South Pas defense forced a three and out on Alhambra’s opening drive, South Pasadena quickly marched down the field, utilizing both the run game and air attack. The Tigers were able to move the ball deep into Alhambra territory, but came up empty handed, as a 28 yard field goal was blocked by the outstretched arms of a diving Moor defender. South Pas broke the scoreless tie two possessions later, when senior Jackson Totleben powered through the Alhambra secondary for a touchdown. The offensive line consistently provided holes for Totleben to run through, propelling the Tiger offense throughout the game. “We can’t be more proud of [the offensive line] for what they did tonight,” Coach Jeff Chi said. 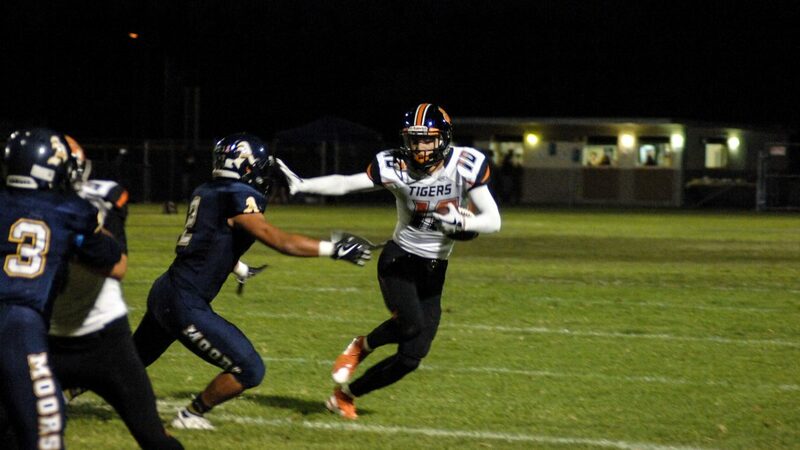 The Tigers extended their lead late in the second quarter off a 25-yard touchdown reception by senior Danny Rios. The long catch and run capped off an opportunistic South Pas drive in which the Tigers capitalized on two Alhambra penalties. Senior Jackson Totleben tries to escape an ankle tackle, while trudging downfield. In the second half, the passing game was firing on all cylinders under the reins of junior quarterback Justin Huff. Huff connected once again with Rios for on a 9 yard touchdown on a corner fade route. The senior wideout finished the night with 2 touchdown catches and 5 receptions. Senior Sidney Luna-Long also added a touchdown reception of his own. “[Alhambra] played a lot of 1 on 1 coverage. We do that a lot in practice so when I saw the opportunity, I took it,” Rios said. The blowout victory is the latest in a string of dominating performances from the Tigers. In the last three games combined, South Pas has outscored their opponents 126-6. South Pas will finish up their preseason schedule with a Thursday night game against visiting Eagle Rock on September 28.